Chinese concert pianist Lang Lang has already become a legend in the world of Classical music. He has many fans in the West, but he’s also developed a colossal following in the Far East, which has directly increased the Chinese appetite for Western Classical music and more specifically, the demand for piano lessons. More than 40 million children are now learning to play the piano in China due to the ‘Lang Lang effect’ (as it’s affectionately known). He has attained rock star status and Time Magazine recently included Lang Lang in the “Time 100”, the Magazine’s annual list of the 100 Most Influential People in the World. So when an illustrious concert pianist teams up with a highly esteemed publishing company, the results can be stratospheric. I was invited to attend the launch of Lang Lang’s new Piano Academy; a series of piano books entitled Mastering the Piano intended for young learners, published by Faber Music. 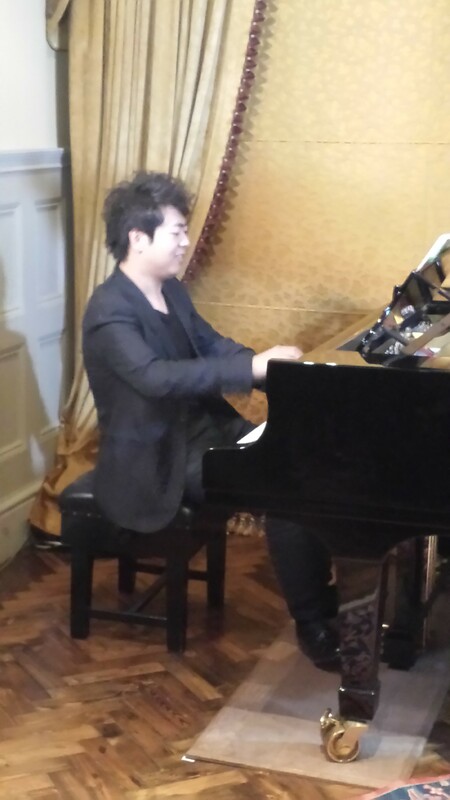 Held at the intimate 1901 Arts Club in Waterloo, London, the event was beautifully arranged with an impromptu performance and talk by Lang Lang himself. He chatted informally about the reasons for collaborating with Faber Music and described it as a lifelong ‘dream’ to produce a series of books such as these. His heart genuinely lies in music education, and for me, this really is a joy to behold; Lang Lang takes the time and opportunity to highlight and endorse the importance of playing the piano, and more importantly, playing it effectively. Glossy, clear and concise, the books are well presented and volumes (or Levels) 1, 2 and 3 are first to be published, with 4 and 5 following later in the year. They focus on ‘how’ to play and are not a piano method per se, as the sub-heading clearly states ‘Technique, studies and repertoire for the developing pianist’. Starting at around Grade 1/2 standard up to around Grade 4, there are plenty of photos, demonstrations and advice from Lang Lang regarding how to tackle various techniques and styles of music. Copious piano pieces, exercises and studies infiltrate the pages, with lots of superlative practice and preparation ideas from correct posture and hand positions, to the importance of rhythm and hand coordination. The launch began with a performance of the Burgmüller Arabesque, from Level 2, after which Lang Lang explained a few vital points concerning fruitful, positive practice. I was delighted he spoke so eloquently about Scales. A pet hate for many students, but as he demonstrated, they are the bedrock of excellent, even piano playing and must be worked at thoroughly, diligently and consistently (he practised them for an hour and a half a day apparently!). Practice ‘features’ or techniques are arranged in chapters (or units); Level 3 contains ‘Exploring the keyboard’, ‘Developing dexterity’, ‘Introducing the pedal’, ‘Chords’, ‘Playing in new keys’, which appear with corresponding advice based around certain relevant pieces and exercises. This is all very useful for those just getting to grips with assorted techniques. The repertoire in each Level is extremely varied, from Scarlatti, Beethoven, Gounod, Grieg, Schumann, and Kabalevsky, to Chinese works arranged for the instrument, as well as pieces and arrangements by favourite contemporary composers and music educators (Paul Harris, Pam Wedgwood and Alan Bullard). I like the inclusion of lesser known composers, such as Bertini, Dunhill, Czerny, Heller, and Gurlitt, who wrote excellent little piano studies for young pianists. In Mastering the Piano, these pieces are assiduously examined, and a wealth of tips and practice suggestions are added at the beginning. Each chapter is preceded by a ‘Message from Lang Lang’. Thoughts on memorization was another illuminated topic at the launch, and Lang Lang emphasised the study of J S Bach’s piano music to help establish this elusive skill, in order for it to become a ‘normal’ part of piano performance. It’s not unusual or indeed unexpected for musicians to be influenced by other art forms, but Lang Lang specifically mentioned the significance of paintings and sculpture for capturing a musical mood. Appropriate paintings are reproduced as a reminder. He finished the presentation by playing a Chinese work entitled Jasmine Flower, a traditional Chinese Song (from Level 1), followed by the ever popular Rondo Alla Turka or Turkish March from Sonata in A major K. 331 by Mozart, for which he received a rapturous reception. These books will no doubt prove popular with a plethora of pupils (of all ages) who want a learning ‘tool’ for help and guidance, as they work to develop a fluent technique and greater musical understanding. They are not designed to replace the piano teacher, or to be a specific ‘method’ studied alone, but rather to be incorporated with other materials to attain a whole and well-rounded piano education. To this end Lang Lang and Faber Music have done a sterling job. After his presentation, the Chinese pianist posed for countless photos, chatting to everyone in the room; for a superstar with a tight schedule (he had two further engagements after this lunchtime event), his kindness, sincerity and modesty are indeed remarkable. Many congratulations to Faber Music for such an innovative project which will hopefully be the start of a great musical relationship.